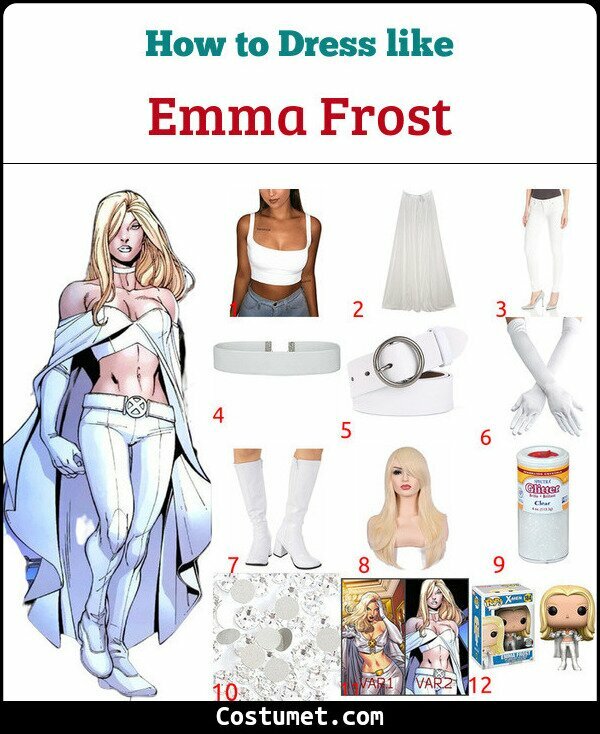 In some versions of the comics, Emma Frost is being referred as the White Queen, and she absolutely looks like one because she often wears white uniforms regardless to the style. In this version, Emma Frost wears a white crop-top with a long wavy white cape, a white choker, long white gloves, white pants with a belt, and a pair of clean white boots. We will also show you what you need to create a diamond makeup and how to do it. Can't wait? scroll down now!! 1 White Crop Top Get a plain white sleeveless crop top to wear. 2 White Cape Put on a plain white cape. 3 White Skinny Pants Match your top part with a pair of plain white pants. 4 Choker Select a white choker to wear. 5 Leather Belt Fasten a white leather belt over the pants. 6 Long Gloves Get long gloves in white color. 7 Leather Boots Match your outfit with a pair of white leather boots. 8 Long Blond Wig Recreate Emma's hairstyle by wearing a long blonde wig. 9 White Glitter Get white glitter for makeup. 10 White Rhinestones Get white crystals and facial glue for the makeup. Then follow the tutorial down below! 12 Emma Frost Funko POP Figure Are you an X-men fan? Get Funko POP version of Emma Frost now! Emma Frost is no stranger to the X-Men comic fans for her character has been around since the 80s. Her character, though is often recognized as a villain, used to be in the X-Men group and even had been a co-Headmistress of Xavier Institute. The fact is known to the reader that Emma Frost's ability is on par with Charles Xavier and Jean Grey for she is a world-class telepath which allows her to manipulate one's mind and other many things such as crate illusions, heal traumas, create psionic blasts, and so on. Regardless to her powerful telepathic ability, Emma Frost is well recognized mainly by her secondary mutation ability which is to transform herself into organic diamond form. Beside being just a feast to the eye, this ability unleashes superhuman strength and durability, as well as her boosts her stamina, which give her an upper hand in fights.